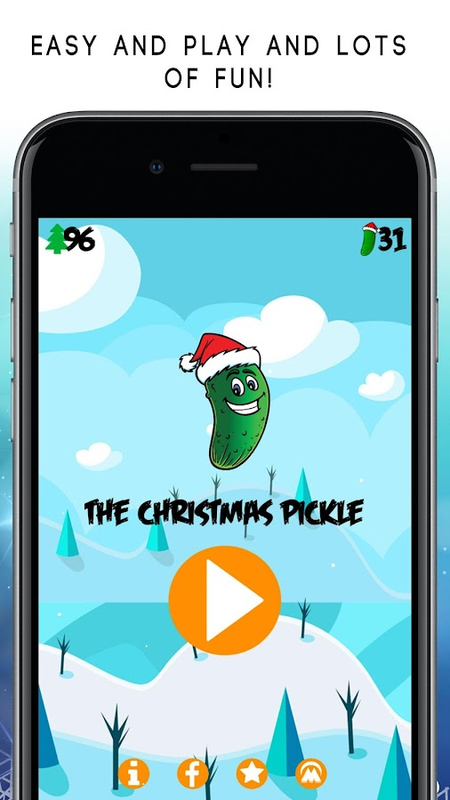 The object of the Christmas pickle game is to collect Christmaspickles!You earn the pickles by plucking the tree limbs from theChristmas trees.When you find a Christmas pickle, tap it, and thepickle will be added to your count.The more you play, and collectChristmas pickles, the better your chancesof achievements: Pickles,New trees, Presents, Tree types, Bonus pickles,Shears, Bombs,Ornaments, Santa Bonus, Multipliers, Tree Angels, Snow,Backgrounds, and more.Tap or swipe the limbs on the Christmas treeto find pickles. Earn additional trees inside the ornaments orpresents. Swipe underneath the tree to go to the next tree.Try notto tap hot pickles - they take from your pickle bank and causedamage!If you have bombs to use, they will clear most of the limbsso you can find the pickles faster. Just tap the bomb icon toactive one. When shears are active, the tree clears fastertoo.Present bonuses have different prizes depending on yourachievements earned. Watch out for the squirrel! If you get thesquirrel the bonus is over! Milk it!The ORIGINAL animal milking game, since 2010Over 10 Millionplayers!Now with all new game play and over 20+ animals tomilk!Milk It! is a hilarious and super funny game to test youranimal milking skills by seeing how much milk you can get from ananimal. Squeeze the udder, and get the milk!Earn coins frommilking, and use those coins for chances to win real prizes!GAMEFEATURESRealistic udder action on all animals to get the mostmilkChoose from a cows, goats, pigs, African animals, dogs, andhumansMilkify photos with funny milk photo frames and share withfriendsEarn virtual coins from playing the milk it game and use thecoins to enter into weekly drawingsWeekly prize drawings for realstuff, like gift cards, computers, accessories, cash, and more! - Save Favoriteslist.- Customize the look and feel to your eyes.Thanks to all theUseless Facts fans out there! We appreciate all the comments andfeedback you send in to us - we are listening! Match the color of the space ball, to thecolor of the ring, line em up - and jump through!This color switch game is loads of fun, and gets more challengingthe higher you go.To play: Just tap the screen to make the space ball jump, see howmany color switching obstacles you can get through! Sirens gives you multiple siren soundscompletewith flashing lights and a horn!Play the ultimate prank on a someone with The Sirens app!Just open the app and tap the screen for a scare likenoother!Includes multiple siren sounds complete with flashing lightsandan ambulance horn good enough to scare the dickens outofsomeone!Here's what you do. Sit in the passenger seat or back seatandwait till the perfect time. Make sure the volume on your Androidisall the way up!Then, open up Sirens and tap the screen then hold thescreentowards a window to create a reflection of the traditionalred andblue flashing police lights so the driver can see. They willseehear the sirens sound and see the lights and then PANIC! It'saclassic trick good over and over again!Can also be used with external stereo speakers for blastingoutsiren sounds at high decibels!Features:√ Police siren√ Ambulance siren√ European squad siren√ Change the sirens with menu phone buttonTap the screen to toggle the action, honk the horn to getpeopleto move :)√ It's so real that we must post the following:This app is for entertainment purposes only.We do not condone the impersonation of law enforcement. AWESOME HOLIDAY CONTENTMake your own talking Santa, talkingElf,nutcracker, or even a reindeer!You get to control a characterand recordyour voice with it for some hilarious fun!★★★ HOW TO PLAY★★★[✔] Swipe to get your character[✔] Set the mood by choosing abackground[✔] Record and talk while you control a charactersmovements at the same time. [✔] Record up to 30 seconds of video[✔]Save your videos and play them back anytime[✔] Share your savedvideos with friends★★★ CHARACTER LINE-UP INCLUDES ★★★[✔] TalkingSanta[✔] Talking North Pole Elf[✔] Talking Nutcracker[✔] TalkingRed nosed reindeer★★★ BONUS FEATURES ★★★[✔] Watch it Snow[✔] Shareover email, SMS, or Facebook[✔] Holiday themed backgrounds★★★DEVICE REQUIREMENTS ★★★This app is intense and requires a newerAndroid devicein order to use it correctly. Multi-touch isrequired, and afast processor! If you see weird things happeningwhenyou animate your characters don't say we didn't warn you!Loadsand loads of Holiday fun.Just imagine if Santa had a specialmessage for someone you know? How about an Elf telling someonewhatSanta is up to this year? Maybe even let that ole reindeer letoff some steam!It's all up to you! You make the movie!Create, save,share..
Test My Brain, the app! A simple yet fun app to exercise yourmind! Full of Riddles, interesting trivia, problems to solve, andmore.The Untapped Power of the Human Brain! Achar Recipes in Hindi Prepare Traditional Pickles(Achar) indifferent and unique style using Achar Recipes in HindiApplication. The interface of the application is very user friendlyand easy to use. The user can get instruction of the recipes ineasy understandable Hindi language. If the user like any recipehe/she can make it as favorite and access it later for quickaccess. Also, share the Achar Recipes using the social media withthe image of the recipe to your friends and family. Please rate andreview this application for encouraging us for future development. There will be 100 different pickles, and your target will be tocapture them all! Move your finger to guide a jar in order to catchthem falling from above!There will be explosive pickles that'llmake you lose lives, others that will make you lose points.. itisn't going to be easy! The more time a game lasts, the harder it'sgoing to be with pickles getting faster and more frequent!Not allthose little green things will be easy to get: there are 10different maps, and there are going to be exclusive ones in eachone of them. Don't worry though, you'll be able to buy all the mapswith in game coins!There's also going to be a store, where you'llbe able to buy maps, coins, and jars containing rare pickles thatmaybe you wouldn't be lucky enough to find normally.There are alsogoing to be various bonuses and hidden easter eggs, who knows ifyou'll be able to find them all...Catching them all however won'tbe enough to finish the game: you'll also have to complete all theachievements (that are going to have rewards)! We offer to you a lot of canning recipes: tasty canning salsa,recipes of canning tomatoes, delicious jam recipes, tasty canningtuna, pickled peppers, canning cucumber recipes, strawberry jam andothers dumpling recipes for you. All canning recipes are presentedwith simple and detailed instructions and photo. You can chooseyour liked recipes and keep them in your favorites. You also canuse a shopping list. Just add the desired product directly from therecipe to the shopping list. In this application you can share yourown delicious recipes and you can leave feedback about otherrecipes! The application does not require the Internet and yourfavorite recipes will always be with you, even when you have notInternet connection! All canning recipes are divided into thecategories for easy use. All recipes are presented with photos forquickly selection. You can find a recipe for your mood! There issimple searching in the app by the name or by the ingredients. Easyrecipes using ingredients you already have in the kitchen. Themajority of recipes we offer can be both prepared and cooked in 30minutes or less, from start to finish. We offer to you lot recipesof: • Delicious canning recipes: Pickled Okra, Sour Pickles, SweetPepper Relish, Pickled Peppers Rings, Dilled Green Beans, SweetPickled Cauliflower, Cucumber Salad in a Jar, Authentic AmishRefrigerator Pickles, Jalapeno Pepper Jelly, Pickled Peppers,Cucumber Kim Chi, Dill Relish recipe, Sauerkraut Relish recipe,Refrigerator Pickles, Pickled Vegetables, Easy & Healthy ChunkySalsa, Carrot Pickles, Pickled Green Beans with Dill and Garlic,Sweet and Spicy Zucchini Pickles, etc. ; • Recipes of jam and sweetcanning: recipe of Grannies Easy Jammy, Pineapple Banana JamRecipe, recipe of Pineapple-Jalapeno Jelly, Pear Relish, recipe ofHomemade Strawberry Jam, Peach Fat Zapper, Peach Pepper Jellyrecipe, Jalapeno Jelly Habernaro Marmalade, Pear Honey, WatermelonPreserves, Homemade Applesauce, etc. ; • A lot of recipes of sauceand dip in cans: Recipe of Hot Cowboy Dip, Honey Mustard Dip,Herbed Buttermilk Dressing, Jerk Ketchup, Spice Ketchup, CurryKetchup, Spicy Peanut Ketchup, Bloody Mary Ketchup, Sun-DriedTomato Ketchup etc. ; • Mexican Garden Mix; • Vegetable Soup; • ChaCha; • Green Tomato Chow Chow; • Sweet and Spicy Zucchini Pickles;• Sweet and Spicy Pickles; • Pickled Green Beans with Dill andGarlic; • Fire & Ice Pickles; • Spicy Dill Quick Pickles; •Icebox Pickles; • Squash Relish; • Mondo Hot and Spicy PeppersPickles; • Homemade Canned Pizza Sauce; • Tangy Spaghetti Sauce forCanning; • Dark and Spicy Eggs; • Red Beet Eggs and much more! Cookwith pleasure! Unique collection of pickle recipe. Make pickle (achar) at home,pure & no preservative. We Indians love pickles. Be it mangopickle, stuffed chili or any other. Adding pickle to your food notonly increases the taste of food but also help in digestion. Onceprepared, pickle lasts for month without any preservative orspecial maintenance. In series of Indian recipes written in Hindifor our Hindi readers, we are proud to introduce this APP on pickle(achaar or achar) recipe. THIS APP IS IN HINDI ONLY. + Clean, clearand intuitive interface. + Better Hindi font for better reading. +Well tested software with no bugs and issue during execution. +Feature to add your rating and add comments. By using this Hindiapp on pickle (achar) recipe, you can make delicious achar at home,This achar is better than one found in market which is full of oiland preservatives. No need to call your mother to learn makingachar at home, now you can make your food tasty by adding manydifferent pickles (achar) to your cuisine. Making achar is reallyrewarding experience. This APP is part of our Hindi recipe bookseries. Use this APP as a hindi recipe book on Indian food. Pleaseinstall and share the app with your friends and family. We hopethis app will help you. Please don't forget to rate us and add yourcomments. Your advises are always welcomed. We are always there toact your comments and give high importance to our audience. This Application Provides most of Achaar Recipes describe indifferent categories.Prepare Traditional Pickles(Achar) indifferent and unique style using Achar Recipes in MarathiApplication.We Indians love pickles. Be it mango pickle, stuffedchili or any other. Adding pickle to your food not only increasesthe taste of food but also help in digestion. Once prepared, picklelasts for month without any preservative or special maintenance. Inseries of Indian recipes written in Hindi for our Hindi readers, weare proud to introduce this APP on pickle (achaar or achar) recipe.Hindi Achaar Recipes App provides you the collection of best andvarious types of indian achaar recipes In Marathi Language.Here youmay get About 500 and more achaar(pickles) all over in differentplaces.it's show easy method to prepare all indian achaar(pickles)recipe. recipe are in Hindi langueses so easy to understand thathow it's made. Looking for the best Canning recipes? Discover the art of the bestcanning recipes for all-year eating, including best-ever dillpickles, tomato salsa, sweet jellies jams and more.Here are thebest canning tips and recipes.Details of canned recipes:- Step byStep Preserving Jam: Triple Treat Berry Jam; Figgy Pear Jam andmore- Try our best canning recipes for perfectly Jelly: Red PepperJelly; Basic Herb Jellies and more- Juices: Canning your own fruitjuice at home is fun and easy- Making and canning your own orangemarmalade: Cheryl's Cranberry Orange Marmalade; Blood OrangeMarmalade and more- Canning Butters: Tips and tricks for the bestfruit butters, Peach Honey Butter and more- Making canned sauce issomething easy: With Step-by-step, Photos, Ingredients and more-How to make pickles: Sweet Pickles; Red Hot Cinnamon CucumberPickles and more- Find and save ideas about Relish Recipes : Withstep by step photos, recipe ingredients and more- Looking forcanned beans recipes? Here are ways that I've found to make cannedbeans more interesting! Canning has never been easier!Make sureyour canning recipes following our guidelines. Pickle is a simple & neat note-taking app. Just like textingyour friend, you can write easily.Use hashtags for easy sort-by& search for your notes.Easy usability - Simple note takingsimilar to texting message - Easy hashtagging for sort-by - Edit,copy, and delete by swipingFast and intuitive notes sorting andsearching - Quick sorting and searching by hashtag - Quick searchby keywordSupport various type of notes - Text notes - Photo notesincluding GIFs - Preview of utube and URLDesign - Simple & neatdesign. - A palette of background colors - Ajustable fontsize.Don’t miss a thing in your day, Pickle it!You can use Picklefor free for 7 days.PermissionREAD_EXTERNAL_STORAGE- Pickle accessyour Gallery for you to use photo note and viewer. Are you looking for Christmas hidden objects games free? Christmascountdown 2017 has already begun so get ready to make a Christmaswish! If you wished for hidden object games for Christmas, you'reat the right place! Download Hidden Objects Christmas Trees andlook for Santa, Snowman, and Christmas gifts in incrediblepictures! Merry Christmas!🌲 1000+ objects!🌠 Enchanting graphics!🌲Catchy sounds!🌠 Excellent hint system!🌲 Awesome zoom feature!🌠 100% free!Supported languages: Chinese, Danish, Dutch, Finnish,French, German, Greek, Indonesian, Italian, Japanese, Korean,Malay, Norwegian, Polish, Portuguese, Russian, Serbian, Spanish,Swedish, Thai, Turkish, Vietnamese.Hidden Objects Christmas Treesis here for all of our avid players! Make delicious gingerbreadcookies and sing your favorite Christmas Carol. Christmas hiddenobjects will become your new favorite game 2017! Solve incredibleChristmas puzzles and enjoy the best hidden games on the app store.Since December is near, Christmas games to play are very popularamong our users and that is why we provide you with another greathidden objects Christmas. Holiday time is here – the time of peace,love, and sharing! So, share these great Christmas party games withall your friends and start playing today! Let the holiday elf enteryour world while you're waiting for Santa Claus! All new Christmashidden object games free especially for you!Download Hidden ObjectsChristmas Trees and let the holiday magic begin! If you'rewondering how many days until Christmas, get this game and feel theChristmas wonder before December begins. Sit by the fireplace andenjoy your favorite Christmas tales! Decorate your Christmas treewith the best ornaments and fill your house with gifts for yourloved ones! Don't wait for the snow to fall in order to beginplaying – we guarantee that this Christmas game will awake theholiday spirit and that you'll enjoy intuitive gameplay andincredible graphics! Hurry up and find objects in rooms – look forSanta hat, snow globe, sleigh, reindeer, and holiday elves. Freehidden object games are waiting for you! It's time to solve theholiday mystery, so enjoy playing hidden objects mysterygames!“Christmas Tree Hidden Objects” - the countdown is here!Ifyou are a fan of hidden object free games, get cozy and enjoylooking for hidden objects in beautiful Xmas pictures! Make friendswith the snowman and find every single secret mystery in ChristmasHidden Objects! If you like playing new year games, you will bethrilled to play “hidden object games free”! Do a complete holidaymakeover with the best hidden object games for kids! Call for theXmas spirit to send you a good Santa Claus who will help you infinding objects in the hidden worlds! The Christmas mystery is here– you shall look for candy canes, Christmas tree ornaments, andSanta figurines! If you're out of party ideas use these mysteryhidden object games to entertain your guests. Hidden ObjectsChristmas Trees just for you! Christmas hidden object games forkids and for adults!Hidden games in December wonderland are theright thing for cold winter days. Free download Christmas holidayhidden objects and decorate your Christmas Tree with the cutestornaments. Holiday games to play are here to cheer up the societywith the best secret hidden objects and mystery stuff. So, are youready for the adventure game free? Winter adventure in a houseunder the Xmas tree filled with presents will become your favoritepastime. Begin solving your mysterious case while you sing to “12days of Christmas”. Do your best to “find objects” in a messy room.The best hidden object puzzle in hidden world! Jingle bells areringing, so hurry up to become the best hidden object detective!Download Hidden Objects Christmas Trees and spend your holidayswith the best app on your phone!